After spending more than a week we in Hungary we entered Croatia from the East. On our way was its capital - Zagreb. My first impression when we reached it was just as if I went back in time to Poland at the turn of the centuries, where Post-Soviet housing projects, modernist architecture, and 19th-century tenement houses were still covered in graffiti. The urban landscape changed when we reached Zagreb’s upper town. Combined by two hills, Kaptol and Gradec, the city center is charming. Colorful low architecture, numerous narrow streets, plazas, parks, and a variety of restaurants and coffee shops, creates a friendly and relaxed atmosphere. But deep within, we were feeling the rush to finally get to the Adriatic Sea. After a short stop in Zagreb, we moved on to the Croatian port city of Rijeka. It was already night when we got there. In order to reach the city, you have to drive down a winding road going downhill. Rijeka streets are narrow, inclined and challenging to drive. We went to sleep quickly after a few glasses of Croatian wine at the main plaza with hopes of seeing more next morning. I woke up before the sunrise and climbed the streets up to the upper part of the city. The view from the top was breathtaking. Beneath me, the city was dividing into two parts, on the left, industrial surrounding of the port, on the right, a warm palette of red roof tiles, creamy walls and cobblestone streets. The background was formed by a blue sea and tiny white boats. Looking for something to eat we came across Rijeka's Main Market – Placa. Positioned just by the seashore in the very center was a quick and easy option for morning grocery runs. It turned out that city markets are one of my favorite places in Croatia. Stalls piled high with fresh local produce and the cheery banter of traders was catching my attention. Familiar Slavic faces. I felt like in my hometown Ełk where I lived as a young kid. Every Sunday, before the church routine, with my childhood friend Lukasz we would go to the city market - our main Sunday attraction. We would wander around and look for adventures. Here, I felt the same eastern atmosphere, familiar faces. Just the surroundings changed to more exotic, Mediterranean, and warm. Since then I visited every market I came across. That’s when this idea occurred - what if we travel through southern Croatia instead of going straight to Italy? - I asked Solieth. “why not” - she responded without hesitation. After seeing the map it appeared we had two options - using a quick, toll highway far from the coast, or the curvy road next to it. We chose the second option. I didn’t want to miss all those views on the way. Obligatory morning press routine for most men. Inside Plaka - Rijeka main market. The curvy road appeared to be really curvy, situated high, between rocky slopes and steep cliffs to the right. Driving that road was really exhausting and stressful - but in the end, it was worth it. The views on the way were just stunning. The next stop on our way was Zadar - the gateway to Dalmatia. Set on a small peninsula Zadar is one of the oldest continuously inhabited cities in Europe. A historic old town of Roman ruins, medieval churches, museums, trendy cafes and quality restaurants make it a popular destination. The City colors are a mix of smooth pastel tones. The streets are made of burnished marble, so smooth that you could almost ice skate across the cobblestones. Among tourists, it is known for its rich nightlife and attractions like Sea Organ and Solar powered Dancefloor. The good thing about driving a car is that you can stop anywhere you like…and I was stopping a lot. The one hour drive was taking me four hours. That’s how I was discovering all the little things on the way - inaccessible beaches between the rocks, little villages with the best bakeries and stunning viewpoints. And that’s how I discovered Sibenik. Man Jumping to the water from The Sea Organs - an experimental installation, which plays music generated by the motion of sea waves through a series of 35 organ pipes built under a set of large marble steps. Zadar. Šibenik wasn’t in my plans. It was supposed to be just a quick stop on our way to Split - get something to eat, refuel the car, catch our breaths- that’s it. But after getting there we decided to explore the old town. Locals were cheerfully drinking their coffee, men with the obligatory morning press in hand - sometimes vigorously debating - kids happily going to school. People were living their daily life. It was pleasing to watch and from my perspective as a photographer - authenticity of the moment is something I am attracted to. Later on, I was told the city center is mostly inhabited by locals and city authorities are trying to maintain it this way. A labyrinth of steep back streets and alleys leads to medieval St. Michael's Fortress which crowns the pyramidal hill above Šibenik’s Old Town. The fort offers a spectacular view of the city and the Šibenik channel. During the summer months, it becomes an impressive open-air stage for cultural events. We decided to stay for a few days. View over Sibenik and its cemetery from St. Michael’s Fortress. In order to enjoy the beach, we stayed near Split for a few days. Split’s outside town is somewhat shabby and the city center felt too busy. It’s the main connection port where everyone catches the ferry to nearby Islands. A lot of ships, people in a rush, many tourists. I even ran into Blaze, a colleague I met in Nicaragua. He was running to catch his bus to Dubrovnik - the world is a small place - I thought - such a random encounter. Of course, I enjoyed Split’s local market a lot - but that’s my personal taste. Our stop farthest to the south was a small town called Omiš. In the xiv century a well known and feared home to pirates is now heavily visited by tours in all shapes and sizes. The town shares an incredible location - it is pressed between a giant rock formation. The Cetina River that divides it in two is a great platform for the voyage up the river’s current. The castle tower rising above the historic city center gives a great lookout to admire the landscape. The main street is a tourist promenade with curfew vendors, all types of souvenirs and hotdogs. From Split, We took a ferry which took us directly to Hvar city located on Hvar Island. On the way, we got caught by a fastly moving storm. Dark gray, low clouds surrounded the boat and heavy rain hit the deck - only the sound of thunder was able to overcome the loud sound. After reaching the Island the first thought we had was to find shelter. Due to weather conditions, it was decided in favor of one of the closest coastal restaurants on our way. Soaked and cold we started by ordering a coffee. The waiter, over fifty, with an apron tightly strapped around his sizeable belly instructed us that only in case of ordering the food we could stay. It would be hard for me to leave a penny in this place. It was also the first time I’ve experienced Croatians to not be friendly and welcoming. As I was about to learn Hvar city is very much focused on making money from tourism - with their own set of rules, restrictions, and way the city is organized. The Hvar town itself is beautiful. Occupying gentle slopes the city is facing Pakleni Islands - an archipelago of paradise looking islands beset by turquoise waters where you can sunbathe, swim, snorkel or…party. Later on, I discovered that Hvar has the reputation of a party town. The promenade surrounding the coast can take you to the tiny beaches between the rocks, little bays with white boats, restaurants or a massive resort on the outskirts. It looks better than it feels and after less than two days we felt really tired of the crowds and its ambiance. Hvar town and Pakleni Islands. Our ferry back to the mainland was sailing off from Stari Grad - little town located on the opposite side of the island. We still wanted to explore more before we left. I remember that in my mind, I had this image of lavender fields covering the island, that my brother told me about. We took a morning bus to Stari Grad. The road takes you up to the heights, where you can enjoy the view over the island, coastal line and the rich blue color of the sea. The Hvar Island is mountainous - during this time of the year, it felt really dry. It’s said to have the highest number of sunny days in all of Croatia. I was carefully examining the horizon in the pursuit of the image I had in my mind. I saw vineyards and olive-groves covering the slopes, calm bays of turquoise water, and single houses occasionally scattered around - but couldn’t spot the lavender. Stari Grad is known to be the oldest town in Croatia. It was Established in the IVth century B.C. by Greeks who named it Pharos. Its cultural landscape has remained practically intact since. The agricultural activity of the surrounding cities fertile plains is mainly focused on grapes and olives, and it has been maintained since ancient Greek times to the present. As opposed to Hvar, Stari Grad provides you with a breath of tranquility. The cool shade of narrow streets and small squares of its city center were helping us survive the midday harsh sun. It was pleasant to get lost in there, quietly explore each corner, peep local life without worrying about getting stuck somewhere between crowds. I spotted a little window in a stone wall below the “vino” signboard. A little while after I pulled a small hanging bell and the vendor's head appeared from the dark long corridor. He let us try a few of his homemade wines. Sweet dessert Prošek and Mali Plavac made of small blue wine grapes that grow along the Dalmatian coast of Croatia - in Croatian Plavo means blue; Mali means small. Our next stop was Pharia, a restaurant we ran into while exploring. What caught our attention and enchanted us was Its beautiful patio. We were waited on by a tall guy with a ponytail, stubble, long flannel-plaid shirt and pleasing manners. When asked about Dj Shadow and Lauren Hill that were playing from the speakers alternately, he summed up with a sincere smile - it's my playlist, it's great someone noticed. I really enjoyed the place - relaxing atmosphere, fresh seafood, kiwi plants full of fruits hanging above us, delicious sweet wine that was improving the mood even more. Unfortunately, It was getting late and our ferry was leaving soon - we should have come to Stari Grad from the beginning - I thought. The way back was pleasing, the Adriatic sea was calm, a gentle breeze was keeping us cool and we admired impressive mountain ranges we were passing by. The Stari Grad Plain - an agricultural landscape that was set up by the ancient Greek colonists in the 4th century BC and remains in use. The landscape features ancient stone walls and trims, or small stone shelters. The Plains bears testimony to the ancient geometrical system of land division used by the ancient Greeks, the chora which has remained virtually intact. Photography assignment for NGO in Nicaragua. 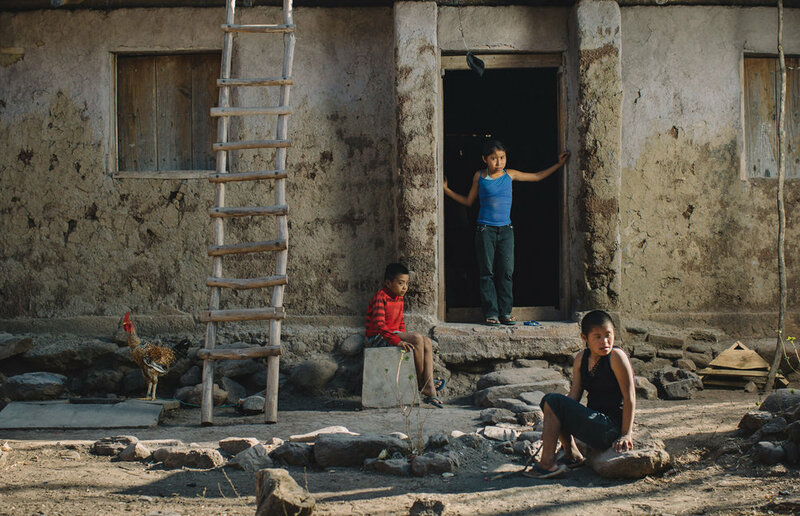 Recently I have traveled with Fabretto Children’s Foundation to the northern Nicaraguan frontier to document different life stories of families from that region. Some places I visited where quite remote, hidden in the mountains and valleys, without an easy access route. And this time I took with me some of my ‘big guns’. What I mean by this is studio lighting was travelling with me, more specifically, on my back (soft boxes, studio lamps, tripods, batteries and all that necessary heavy stuff). I tried to portray stories of hardworking and proud people that move their life forward to better future, regardless of the circumstances. Children, youth, parents, teachers, the entire comunities take this effort, despite difficult conditions. The 19-year-old Ever has always had a connection and passion for bees. Trough education he developed entrepreneurial skills, which prompted him to organize a honey cooperative with other young people. Ever says that the bees have taught him a lot on how to work together for the good of the whole community. How old does Maria look? Maria with her mother and her siblings on the bank of a river near her house, the place where she likes to read and learn. 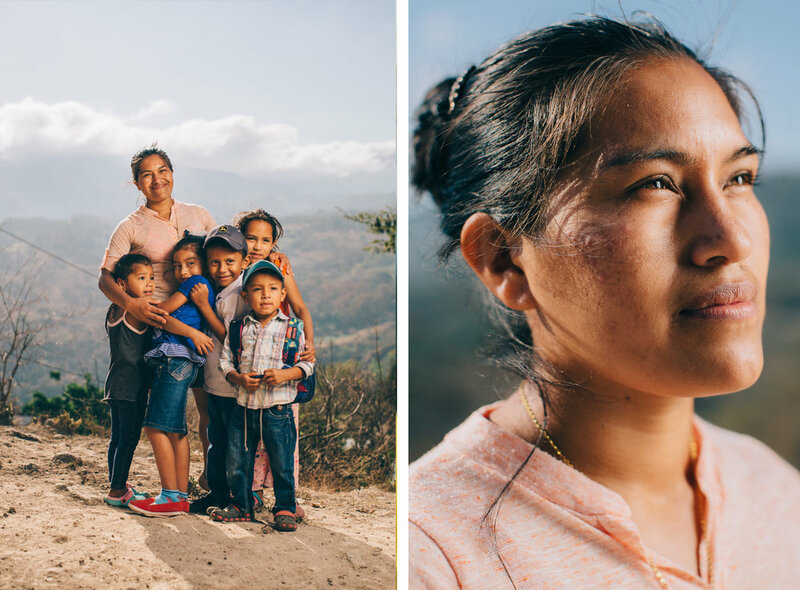 27-years old Yolanda, surrounded by her students, is the local preschool teacher. Due to a lack of space and resources, the Ministry of Education has not yet opened a formal preschool teaching position in Apanaje community. Instead, educators like Yolanda are asked to step up to the plate as volunteers, earning a stipend equivalent to only a fraction of the minimum wage. Come rain or shine, the preschoolers and their brave teacher can be found in the school hallway or yard. "Starting with something as simple as teaching children to hold a pencil, I know that I am helping them start their education off on the right foot.” claims Yolanda. Doña Petrona and Don Jacobo are a farming couple that lives at the foothills of the San Cristóbal volcano. The couple makes a living out of producing basic grains. “Women in my community are not used to working alongside men… that’s why they call me crazy, but I’ve gotten something good out of this madness,” In the most of Latin American countries machismo is a great challenge. The couple has had to face the catastrophic effects of climate change, such as drought, pests, La Niña weather conditions, among other drawbacks. On our way to Maria's house. After all, travelling with a lot of equipment is not a big deal if you are accompanied with right people. 5 am. The wind appeared to be brutal that day. My friends from Fabretto Marketing Team struggling against heavy gusts of wind while helping me to sustain the lights. Thanks girls!! My Photography illustrate Fabretto 2017 Annual Report. The Tola Region is one of my favorites areas in Nicaragua. Gorgeous beaches, tranquility, and salt in the air. Robert and Grace fell in love with this place, like I once had, and had chosen this spectacular scenery to be their wedding venue. They also told me they wanted to share its beauty with their loved ones. The ceremony took place right on the Popoyo beach next to an impressive rock formation called the ‘Magnific Rock’. The reception dinner and party were held in the hotel above accompanied by live music. A beautiful, intimate and relaxed ceremony filled with love. Nicaraguan beaches are spectacular - ocean, sand, waves crashing onto rock formations, all surrounded by tropical forests. Megan and Aquil have chosen these surroundings for their intimate destination wedding. Simple and beautiful. It was a pleasure, honor as well as fun for me to photograph them.